*Prices above do not include the City of Chicago rental tax. Note that the minimum rental period is two months, for which we bill in advance; after that we bill monthly. Please refer to our instrument rental page for additional details. Some students and/or parents decide to purchase an instrument after seeing significant progress with lessons. This may be the same instrument they have been renting or may entail a move up to a better instrument for a serious student. Midwest String Rentals’ parent company, Darnton & Hersh Fine Violins, offers instruments for sale in all price ranges and our staff is always available to help you explore the options. Our liberal equity-building program gives progressing students a range of options when they are ready to buy an instrument. 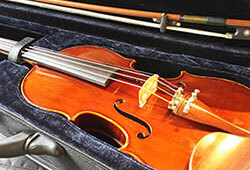 Fifty percent of the first 24 months of rental fees may be credited toward the purchase of an instrument from Midwest String Rentals.